Covercraft is in the business of protecting your vehicle inside and out with durable fabrics and thoughtful innovations for you …and your pet. We think everyone at Covercraft is a dog lover, because they really make an effort to accommodate our four-legged friends. Their Pet Pad Seat Cover keeps your seat clean while the Roadie holds Rover still while the vehicle is moving. 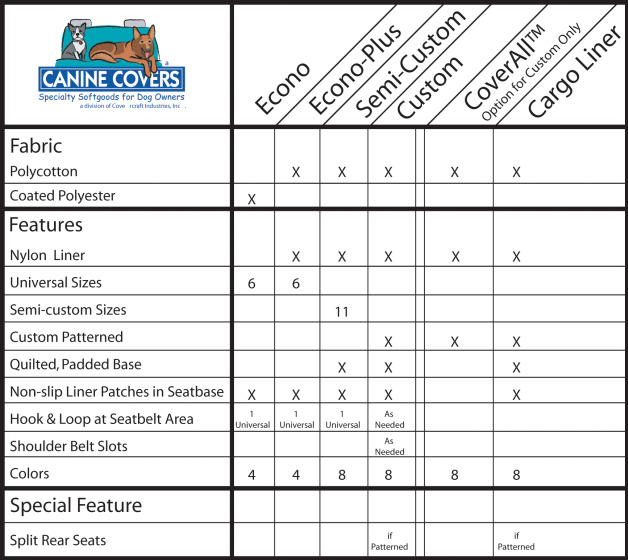 But this takes the cake: Covercraft Canine Covers are “specialty softgoods for dog owners”. Available in six different designs, these covers make traveling with your best friend cleaner and more comfortable for him than ever before. These are more than seat covers. 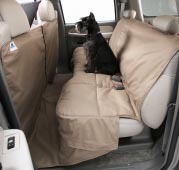 Covercraft’s Canine Covers® are water repellant, padded, breathable, non-slip, adjustable, and machine washable fabric covers for your back seat and cargo area. You can choose the Econo Rear Seat Protectors for quality protection at an affordable price, or you can go for Econo Plus, Custom or Semi-Custom. They all provide great protection for your seats and comfort for your pet, but some of the features vary. Read in detail about each seat protector style to select one that suits you and your dog’s needs. If your pooch likes to roam while you drive, Covercraft has three more options that will keep your vehicle covered. If you have selected a Custom Rear Seat Protector, you may also choose to add the CoverAll®. This is an additional piece of specialized fabric that attaches to the skirt of the seat cover and covers the floor and the rear of the front seats. Even if your dog stands up on the back of your seat, your upholstery is protected from dirty paw prints and sharp claws. If you own an SUV or wagon and you’d prefer your dog to stay in the cargo area, consider the Cargo Area Travel Liner. It’s made out of the same durable fabric as the seat covers, but it is a soft, cushioned pad that covers the entire cargo area and the back of the rear seat. Just fold down your third row of seats and your pet will have plenty of room to stretch out for a nap. It’s no secret that dogs like to stick their heads out of the window. Protect your door from scratches and doggie drool with a Door Shield. Available in 22 or 26” wide, this polyester panel hangs over the inside of the door and keeps it clean, dry, and scratch-free. If your canine companion is content to relax at home, give him “The Ultimate” Dog Bed. It’s 35” wide by 25” deep with fluffy bolsters on three sides. It’s also made out of the tough, water-resistant polycotton material so you can throw it in the back of your SUV when its time to hit the road. Custom embroidery is optional for the pet bed only. Zippers allow you to remove the padding and toss the cover in the washing machine. Your pet will be cozy and comfortable at home and on the road. Color availability varies with each item. All Covercraft Canine Covers are well made and durable. The next time your pet comes along for the ride, you can be sure your vehicle is protected with Covercraft. Due to manufacturer’s requirements, returned Canine Covers orders will incur a 15% restocking fee. Canine Covers ship from the manufacturer via ground service. Expedited and international shipping are not available.